If you have ever awakened with a numbness or tingling affecting your arm or hand, you may immediately wonder how or why it happened What does it mean for part of the body to “fall asleep”? Consider the anatomy of the arm and how compression of the radial, ulnar, and median nerves may all cause numbness, tingling, and weakness affecting the upper extremity. Learn how positioning in sleep may lead to medical conditions like Saturday night palsy, honeymoon palsy, and even carpal tunnel syndrome. Finally, explore some of the treatments that may provide relief. What Does It Mean for a Body Part to Fall Asleep? 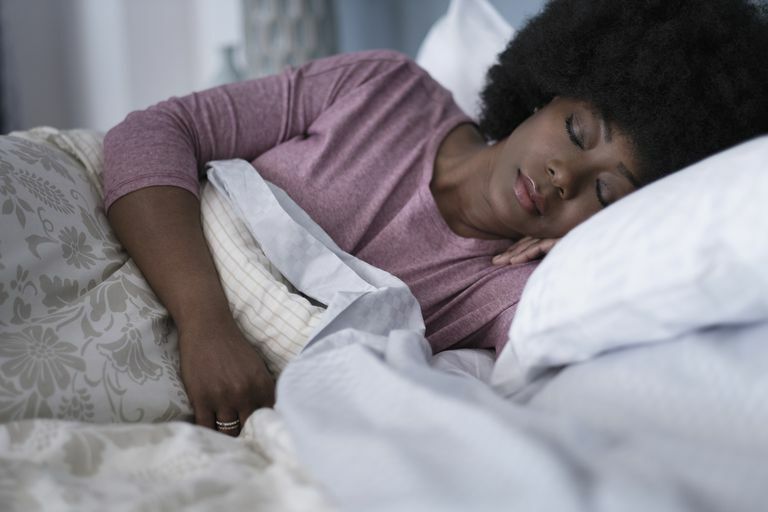 It is common to say that a body part has “fallen asleep” when it feels numb—with a noticeable lack of sensation—or has a pins-and-needles sensation or tingling (sometimes called a paresthesia). There may be pain or other discomfort associated with this feeling, especially as recovery ensues. What causes these phenomena? Many people mistakenly believe that these symptoms occur due to a temporary loss of blood flow to an extremity, such as to the foot or hand. In fact, the cause may instead be due to the compression of the nerve supplying the body part. Often, the blood supply (including both arteries and veins) runs together with the nerve responsible for conveying sensory information and to activate muscle activity. In some cases, damage to the blood supply of the nerves may lead to impairment, but it is typically pressured on the nerve itself that has meaningful impacts. Nerves may be at higher risk of becoming damaged in specific conditions. This impairment may be generalized, leading to dysfunction of multiple nerves. Nerve damage is also called neuropathy. It is possible for neuropathy to be isolated to a few nerves, or even to a single nerve. The most common generalized nerve damage is peripheral neuropathy. It often affects the longest nerves of the body, those that extend to the feet and lower legs. It may be triggered by diabetes, hypothyroidism, vitamin B12 deficiency, chronic kidney disease, or exposure to heavy metals. Over time, the nerves may gradually become damaged and this injury is often irreversible. With this history, it is also more likely that damage to a single nerve may occur. There is also a rare genetic disorder that can predispose towards isolated nerve injuries. Known as hereditary neuropathy with a predisposition to pressure palsies (HNPP), it leads to episodes of weakness and loss of sensation often associated with compression of single nerves. It is autosomal dominant, making a family history very common. Affected individuals report frequent difficulty with nerve damage that results from everyday activities, including waking with symptoms out of sleep. Injury to the radial nerve may or may not cause a loss of sensation or tingling, depending on where the compression or disruption occurs. There may be a variable weakness. The cause of the injury may determine what kind of impact may be anticipated. One of the most common injuries is called Saturday night palsy. It occurs when there is compression of the radial nerve at the spiral groove of the humerus (the bone in the upper arm above the elbow). It may be incited due to compression of the nerve against the bone when the arm experiences prolonged pressure. This may occur if the arms are draped over a chair, such as during drunken sleep, hence its name being associated with a night of the week when excessive drinking may be more likely to occur. There may be resulting weakness in the extension of the fingers and wrist—and rarely the triceps is involved. There may be a loss of sensation on the back of the thumb and first few fingers. It is also possible for the radial nerve to be injured higher up. In honeymoon palsy, the weight of a sleeping partner’s head may compress the nerve closer to the shoulder. Similarly, the use of crutches may lead to injury to the nerve at the armpit. In posterior interosseous syndrome, similar weakness is noted in finger and wrist extension, but there is no sensory loss. Ulnar Nerve: Tennis or Golfer’s Elbow, Anyone? Inflammation or injury to the ulnar nerve, most often at the elbow, leads to common conditions of overuse such as tennis or golfer’s elbow (lateral and medial epicondylitis, respectively). Pressure on the ulnar nerve during sleep may also contribute to the arm falling asleep. In particular, prolonged or frequent resting of the flexed elbow on a hard surface (such as at a desk or in an armchair) may compress the nerve. Sustained flexion of the elbow during sleep may also contribute to ulnar neuropathy. When the ulnar nerve becomes entrapped at or near the elbow, weakness of the intrinsic muscles in the hand may lead to diminished grip strength. In addition, numbness and tingling over the fourth and fifth (ring and pinky) fingers and the corresponding side of the hand (called the hypothenar eminence) may result. Weakness in the long flexor muscles of these fingers may also develop. It is also possible for the ulnar nerve to be compressed at the wrist. In this case, the weakness is isolated in the intrinsic hand muscles and other muscles are unaffected. There may be similar pain or numbness in the ulnar aspect of the hand. Carpal tunnel syndrome is the most common neuropathy affecting a single nerve. It involves injury to the median nerve characterized by compression as it passes under the flexor retinaculum, or transverse carpal ligament, an unyielding fibrous sheath at the wrist. Within this tunnel pass tendons that flex the fingers, blood vessels, and the median nerve. Inflammation or swelling within this passageway may lead to symptoms affecting the hand at night. Nighttime pain, burning sensations, tingling, or numbness may extend to the palmar aspect of the thumb, index, and middle fingers. This may be noted with awakenings from sleep. Pain may also seem to radiate into the forearm. Symptoms are often worsened by overuse of the hand or wrist. Though it may affect both hands, it is usually greater in the dominant hand. In advanced cases, weakness or wasting of the abductor pollicis brevis muscle that draws the thumb toward the hand may develop. Beyond the predisposing factors for peripheral neuropathy described above, the median nerve may be more likely injured in pregnancy, obesity, rheumatoid arthritis, gout, and other conditions. Approximately 3.5 percent of the general population experience carpal tunnel syndrome. Is It Safe for an Arm to Fall Asleep? No matter what nerve is involved, you might wonder: Is it safe for an arm to fall asleep? Fortunately, if your arm falls asleep at night, the symptoms will likely resolve before you fully awaken for the day. In fact, intermittent compression of peripheral nerves occurs often during sleep. These may produce transient sensory symptoms or even weakness in the hand or arm. Many episodes likely go unnoticed as sleep resumes. Recovery occurs rapidly, and rarely is further diagnosis of treatment needed. If symptoms do not fade in the early morning hours, consider additional evaluation and treatment options. It may be necessary to be seen by a neurologist who will take a thorough history and perform a detailed physical examination. Imaging of the anatomy of the neck, brachial plexus, or sites of possible compression—including computerized tomography (CT) scans or magnetic resonance imaging (MRI)—may prove necessary. Electrical studies of the peripheral nerves may be arranged through a neuromuscular specialist, including nerve conduction studies (NCS) and electromyograms (EMG). When left untreated, neuropathy may lead to long-term damage with persistent numbness, tingling, and loss of muscle mass or function. It is important that the upper extremity is comfortably supported during sleep. The wrist and elbow should be neither flexed nor extended for prolonged periods during sleep. If it would cause discomfort while awake, it is a position that should probably be avoided for prolonged periods during sleep. Most of the time, a person will wake and readjust, but excessive alcohol or sleeping pills may lead to unhelpful impairment. Radial Neuropathy: Most injuries caused by pressure usually improve in 6 to 8 weeks. Possible fractures affecting the humerus, especially those unknowingly incurred during a state of drunkenness, should be excluded as the prognosis may be poorer. Ulnar Neuropathy: Rest and avoidance of triggers (such as prolonged elbow flexion) may be most helpful. Surgery with decompression at the site of impingement may be a last resort. Median Neuropathy: Wrist braces or splints, non-steroidal anti-inflammatory drugs (ibuprofen, naproxen, etc.) and local corticosteroid injection may be helpful. When more severe symptoms occur, with loss of sensation or atrophy of muscles, carpal tunnel release through surgery may provide immediate relief. This may require consultation with a neurosurgeon or a hand orthopedic surgeon. Luckily, waking with a hand or arm that has fallen asleep at night is typically harmless. Pressure on the radial, ulnar, or median nerves may occur due to sleep positioning. The symptoms may resolve quickly upon awakening and have no long-lasting impacts. If the symptoms occur frequently or become disruptive to sleep, it may be time to speak with a doctor. Simple interventions such as a wrist brace may provide relief. In some cases, surgery may be the treatment of choice to ensure resolution and optimal function of these vital nerves. Harati, Y and Bosch EP. “Disorders of Peripheral Nerves,” in Neurology in Clinical Practice. Eds. Bradley WG, et al. Butterworth, Heinemann, and Elsevier. 2008. 5th edition. pp. 2262-2266. Misulis, KE. “Hemiplegia and Monoplegia,” in Neurology in Clinical Practice. Eds. Bradley WG, et al. Butterworth, Heinemann, and Elsevier. 2008. 5th edition. pp. 346-347. Moore, KL and Dalley, AF. "Clinically Oriented Anatomy." Lippincott Williams & Wilkins, 4th edition, 1999, pp. 665-830. Papanicolaou, GD et al. “The prevalence and characteristics of nerve compression symptoms in the general population.” J Hand Surg, 2001, vol 26, pp. 460-466. Spinner, RJ et al. “The origin of ‘Saturday night palsy’?” Neurosurgery, 2002, vol 51, pp. 737-741.